Thornhaugh Street, Russell Square, London WC1H 0XG, U.K.
One of the most critical targets of environmental activism is the opposition to nuclear power: ultimately an inexpensive form of energy whose profoundly deadly power makes it an environmental gambit in the modern world for those seeking less immediately pollutant forms of energy such as coal or profligate forms such as oil. This presentation looks at a documentary presentation of the resistance to Taiwan’s highly controversial Fourth Nuclear Power Plant, built in the northern fishing village of Gongliao. While certainly an “activist” production, equally intriguing is the style in which it was produced. Filmmaker Cui Suxin uses a “second-person” voiceover to narrate her work, addressing a “you” whose identity is only ascertained midway through the film. Christopher Lupke examines this unusual form of narrative structure and speculates on the dramatic effect it has for the viewers. The film, produced in the mid-2000s, can now be viewed with the mediating event of the Fukushima Nuclear Disaster in mind, thus raising the stakes for this risky form of energy production. One thread that runs through most of Taiwanese auteur filmmaker Hou Hsiao-hsien’s films from beginning to end is the visual display of motion: travel, flight, quest, sojourn, jaunt. Much is made of Hou’s static camera in his early films and the slow pan of his later cinematographic style. But what is enframed in the shot is often some effort to get somewhere. Despite, that what one finds pervading his films is an inability to achieve one’s goals, an inability to get where one wishes to go, or an inability of the movement through space to effect the ends that one had intended. 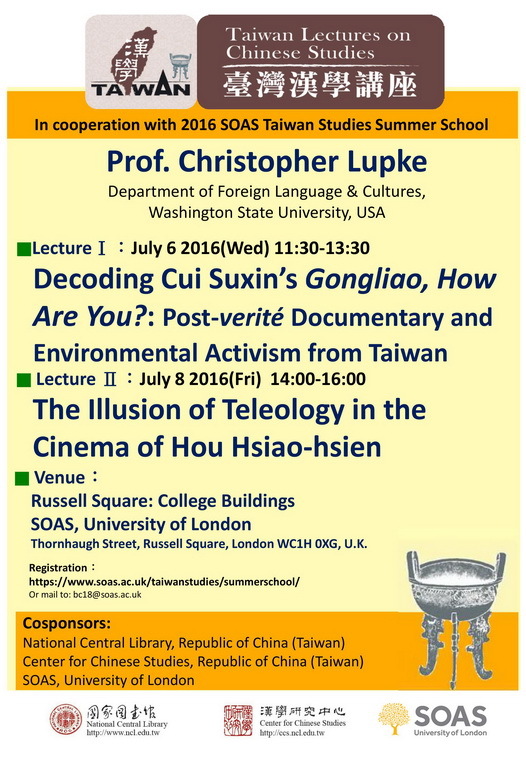 In this presentation, Christopher Lupke, author of The Sinophone Cinema of Hou Hsiao-hsien, will discuss a range of Hou’s films from throughout his career, suggesting that despite a wide variety of subject matter, settings, and themes, one constant in his film is the illusion of teleology. His films often early on posit a desire to get somewhere but seldom accomplish it. Christopher Lupke（陸敬思）is Professor of Chinese and Cinema Studies at Washington State University where he has coordinated Asian languages for the past sixteen years and chairs the Center for the Humanities Planning Group. A specialist in modern Chinese culture, Lupke was trained in classical and modern Chinese as well as cultural theory and film at Cornell University, obtaining his Ph. D. in 1993. Much of his early scholarship was dedicated to literary studies of Taiwanese authors. He continues to have a strong interest in the culture and society of Taiwan and Sinophone Studies in general. His most recent publication is the book The Sinophone Cinema of Hou Hsiao-hsien: Culture, Style, Voice, and Motion. Lupke has edited two books, The Magnitude of Ming: Command, Life and Fate in Chinese Culture and New Perspectives on Contemporary Chinese Poetry, and edited or co-edited four special theme issues of journals. He also translates. His publications have appeared in Journal of Taiwan Literary Studies, Taiwan Literature, and other journals and edited volumes.